We’d love your help. Let us know what’s wrong with this preview of Nelson Mandela by Beatrice Gormley. Civil rights activist. World leader. Writer. Throughout his life, Nelson Mandela took on many roles, all in the pursuit of peace. Born in 1918 in South Africa, he grew up in a culture o Get a behind-the-scenes glimpse of what it takes to change the world in this comprehensive biography that tells the complete life story of internationally renowned peacemaker Nelson Mandela. Civil rights activist. World leader. Writer. Throughout his life, Nelson Mandela took on many roles, all in the pursuit of peace. Born in 1918 in South Africa, he grew up in a culture of government-enforced racism and became involved in the anti-apartheid movement at a young age. Deeply committed to nonviolent activism, Mandela directed a peaceful campaign against the racist policies of his South African government, and spent twenty-seven years in prison as a result. In the years following his emergence as a free man, he continued his efforts to dismantle the country’s apartheid system and was awarded the Nobel Peace Prize alongside South African President F.W. de Klerk. In 1994 he was inaugurated as South Africa’s first black president and served until his retirement from active politics in 1999 at the age of eighty-one. He continued to promote global peace until his death in 2013, and his legacy lives on. To ask other readers questions about Nelson Mandela, please sign up. I definitely enjoyed this book immensely. 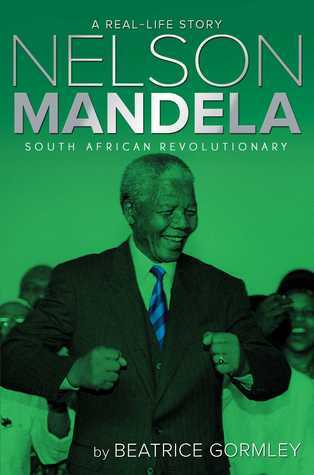 It encompasses many aspects of Nelson Mandela's life with reader-friendly text. It is the right amount vehement so that the reader can add their own opinion to the story, but will probably lean towards one that the author suggests. Although the story is a bit slow, I ate this book and all the facts in it up. Wow. Mr. Mandela went through so much in his life. What an incredible man! A good book for the basics of South African history and Mr. Mandela's life. Doesn't dwelve into a lot of depth, and good as a beginner's book. This is well written and includes a ton of information about Mandela. He's an important figure for students to read about for sure, but I doubt this book will do a good job of enticing readers who aren't already into history and/or biographies. It's packed with so much detail, which is a good thing, but it also feels a bit like so much detail squeezed out any chance of this having a narrative feel. Not that non-fiction always needs to be narrative in style, but I do think it helps to pull in a y This is well written and includes a ton of information about Mandela. He's an important figure for students to read about for sure, but I doubt this book will do a good job of enticing readers who aren't already into history and/or biographies. It's packed with so much detail, which is a good thing, but it also feels a bit like so much detail squeezed out any chance of this having a narrative feel. Not that non-fiction always needs to be narrative in style, but I do think it helps to pull in a younger audience. So if you're looking for some non-fiction to hook a younger reader, maybe don't start with this one. Gormley, Beatrice Nelson Mandela: South African Revolutionary, 237 pgs. Aladdin (Simon), 2015. $17.99. Language: G (0 swears); Mature Content: PG; Violence: PG. Nonfiction. Nelson Mandela was the symbol for antiapartheid in South Africa. This simple biography follows him from his childhood, through his growing activism, his years imprisoned on Robben Island, his eventual election as president of South Africa, and finally his death at age 95. The book includes a timeline and a glossary at the back Gormley, Beatrice Nelson Mandela: South African Revolutionary, 237 pgs. Aladdin (Simon), 2015. $17.99. Language: G (0 swears); Mature Content: PG; Violence: PG. Nonfiction. The book includes a timeline and a glossary at the back. I thought the author did a wonderful job of telling one man’s incredibly complex story in a concise manner that will be easy for a young adult reader to understand. The book is exactly what it claims to be—the story of Nelson Mandela—and it relates his story without becoming overly political or biased in any way. It is written in a style more appropriate for a middle school audience, but the book would be acceptable for a high school audience as well. The book earns its PG rating for the mention of some of the violence and ugliness surrounding apartheid. Since age 9 Beatrice had wanted to become a writer. But it wasn't until after her children were born that she really focused on her writing. In 1 Born in Glendale, California, Beatrice grew up in Southern California. After graduating from Pomona College, she worked in publishing near San Francisco. There she met and married Robert Gormley, and they moved to Massachusetts. They have two daughters. Since age 9 Beatrice had wanted to become a writer. But it wasn't until after her children were born that she really focused on her writing. In 1981 her first book, Mail Order Wings,was published. Since then she's written many popular novels and biographies for young people. Her most recent books are Friends of Liberty, a novel of the Boston Tea Party, and the biography Pope Francis: The People's Pope.